The fine weather over the past few days has made me appreciate the spring bulbs, not that there was much time to stand and stare! But I did take time to take a closer look at some of the new varieties I planted last autumn. I didn’t go crazy and but I planted a few old favourites and a few I hadn’t grown before. Here are a few of them. 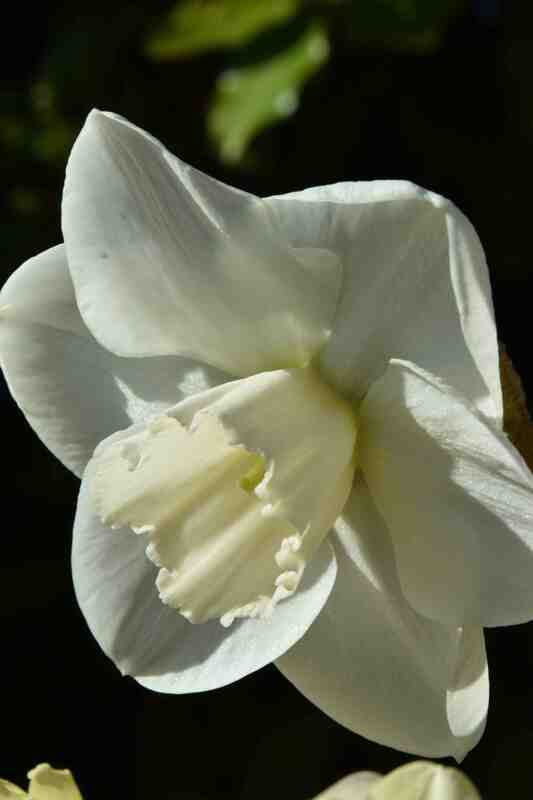 Although I would not like them ‘instead’ of ‘normal’ daffs, I do like split corona daffs. The cup or trumpet is split into six segments that lay flat against the true petals and have an interesting look. The early ones were a bit ugly really but as they have been developed and the cup segments have got more frilly and showy I think they have become much prettier. I know they are not for everyone and I know ‘they don’t look like dafodils’ but they are pretty in their own right I think. 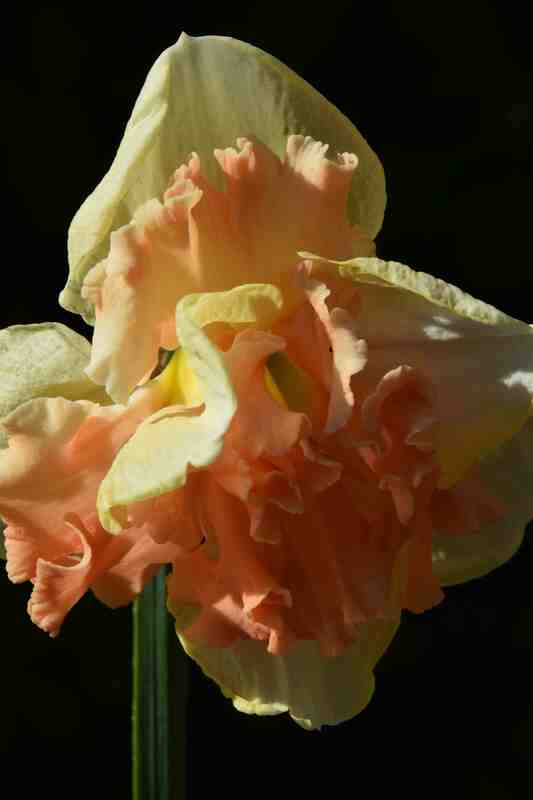 ‘Vanilla Peach’ is interesting and the cream petals become deeper in colour as the flowers age. I can’t really love it because it reminds me too much of nylon knickers that have been washed too often – not that I have much experience of such things. And on to the strangely named ‘Sunny Girlfriend’. 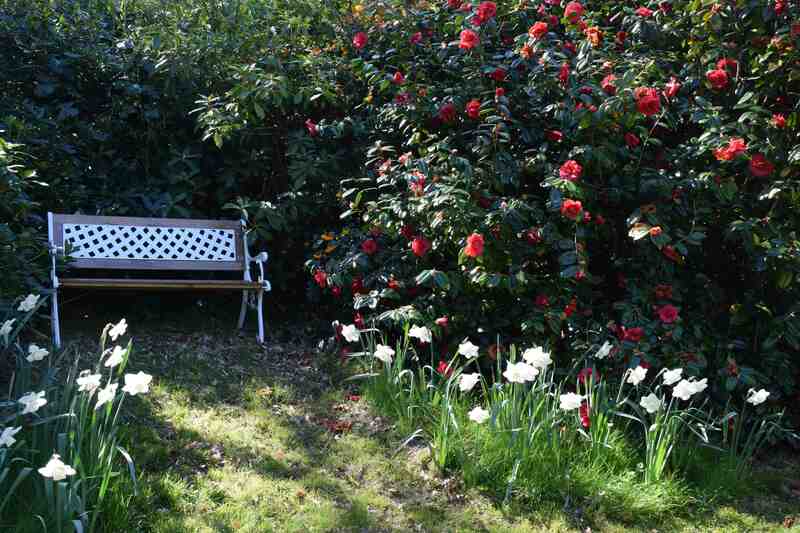 This is similar but a bit flatter in form and with white petals. Both make a good garden display and the stems are tough enough to hold the flowers up. Both grow to about 40cm high and they have withstood wind well. Of the two I think ‘Vanilla Peach’ has the best garden presence but I would recommend both for the garden and for cutting. After those two slightly freaky customers we move on to an exquisite beauty. 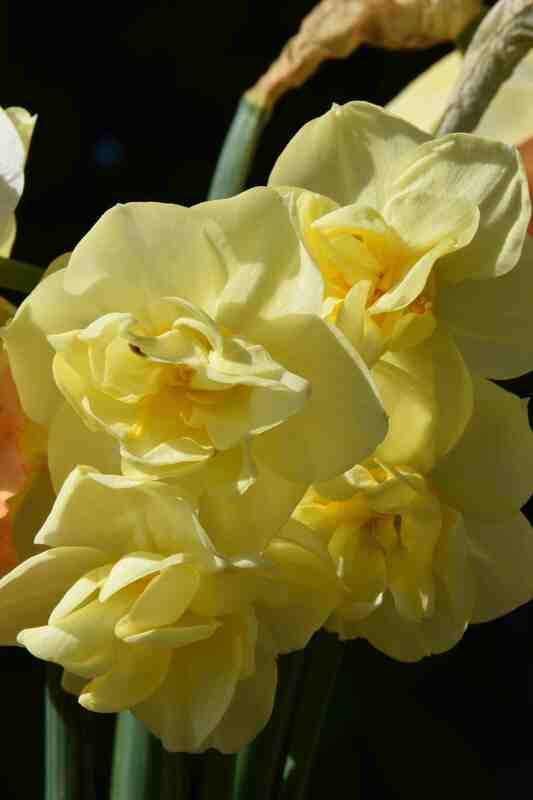 ‘Hawera’ is a well established (old) and easily available daff from New Zealand that deserves a place in every garden. 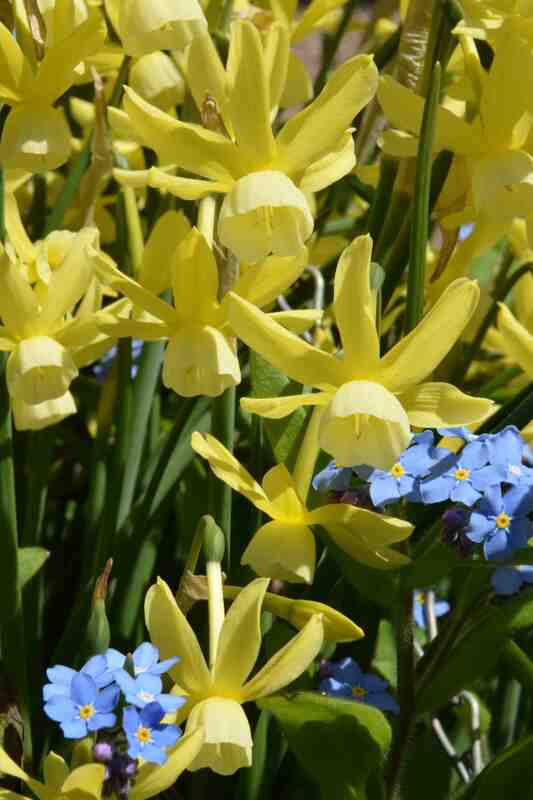 Reaching about 20cm high in flower it likes a bit more sun than most daffs and the small bulbs need planting en masse for best effect. But then the narrow stalks and leaves will almost disappear as the sulphur yellow flowers open. 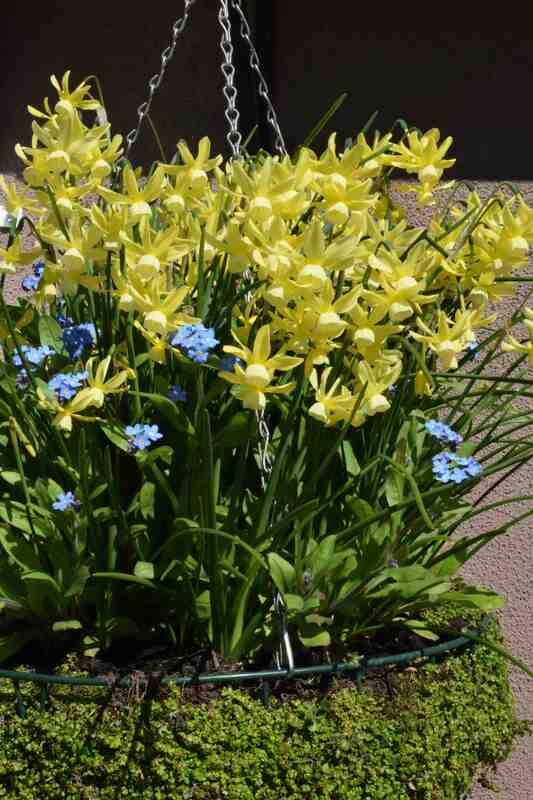 They are elegant but bright and I packed them into a basket with some forget-me-nots and I like the combination. The forget-me-nots are just about managing to flower in time to make a contrast. Oh and it has a moderate fragrance too. 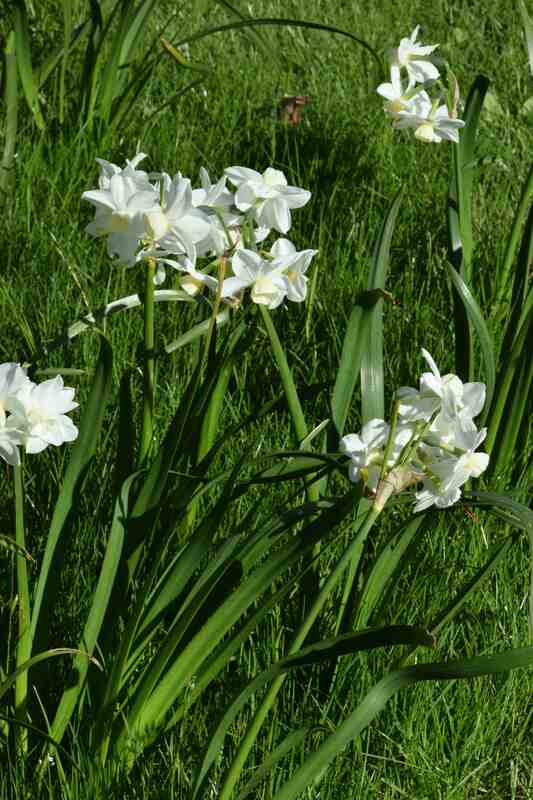 The ‘spare’ ‘Hawera’ bulbs were planted in grass under Japanese maples. The bulbs from the basket will go here when they die down. Because I need cut flowers I planted some ‘Yellow Cheerfulness’. Though this is as old as the hills (1937) I still like it because it is easy to please, flowers quite late and the flowers, like most Tazetta types, smell delicious. Each stem carries two or three, sometimes four, small flowers. It is perfectly named. There is a plain ‘Cheerfulness’ which has cream flowers and is just as nice, but I prefer this one. ‘Silver Chimes’ is another Tazetta with stout stems carrying many flowers and deep green leaves. It is a rather strange choice for naturalising but I like it against the green grass and the scent is nice. The star of the show is ‘Stainless’. I have coveted this for some time. 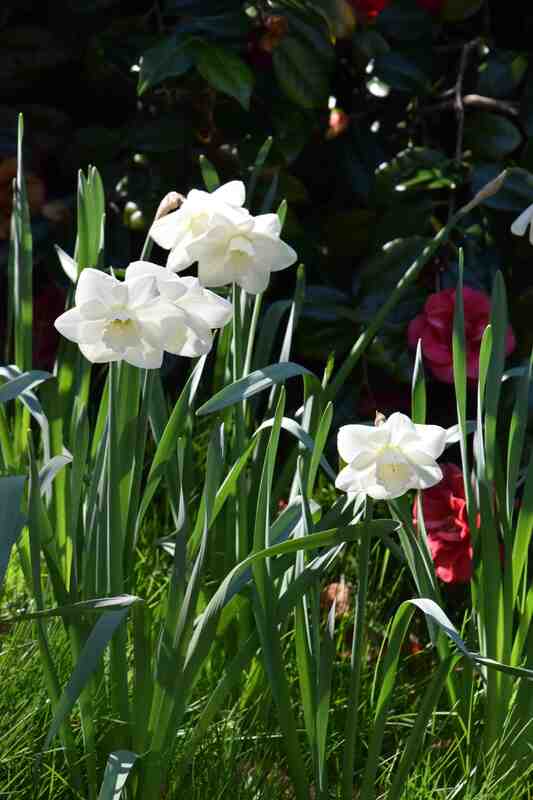 Though I like the trumpet daffs I prefer the shorter-cupped types for some reason and though yellow is fine, pure white is nice too. Really ‘Stainless’ is a bit too good for naturalising in grass but I did it just the same. 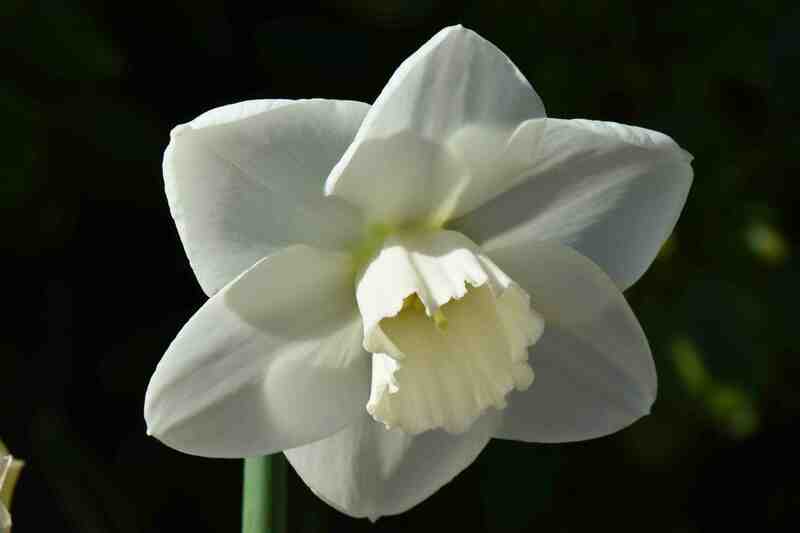 Its form is so fine that it is really more a show daff or one to pick and admire! What I like about it is the icy freshness of the flowers; pure white with a green throat to the blooms and perfect form. The flowers are large but not ungainly and the cup is neat, straight and tailored; crisp as starched linen. The petals are broad and overlapping and form a perfect foil for that cute cup. The stems are strong and tall and the flowers hang ever so slightly so they have style and poise. They remind me a bit of a tropical eucharis. The blooms have a light scent. I love this SO much. I will have to look out for N ‘Stainless’, high praise indeed. I have N. x odorous which I feel the same about! It is plain yellow & quite similar in shape except it is double headed. 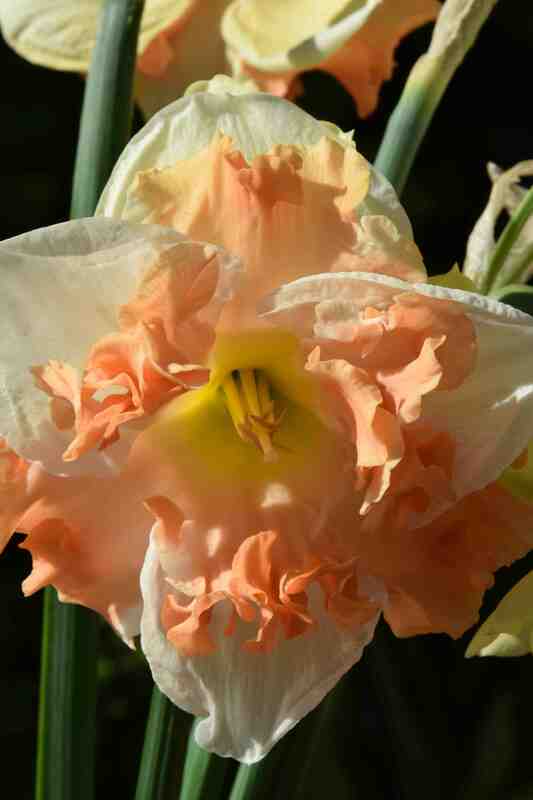 The second head develops & opens much after the first giving it a v long flowering period – quite a late daff. 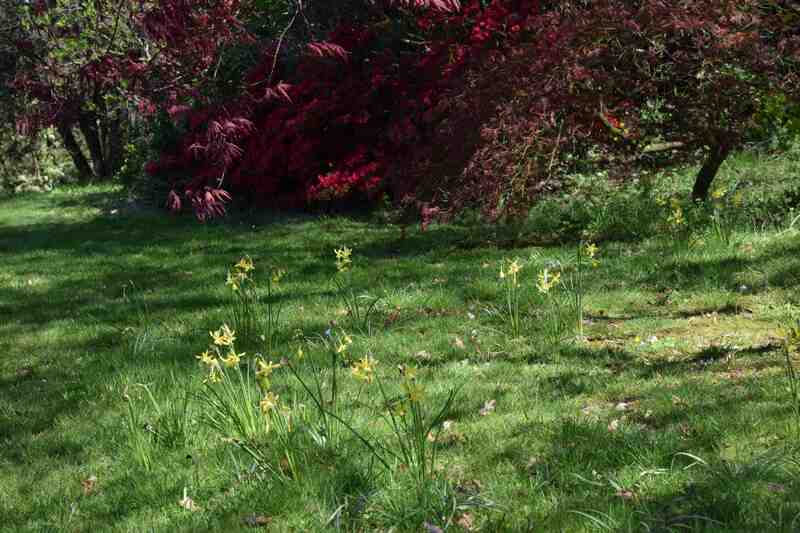 The foliage is v fine & neat, it seems to handle rain & wind too & the scent is divine – quite different to other daffs. Do try it. 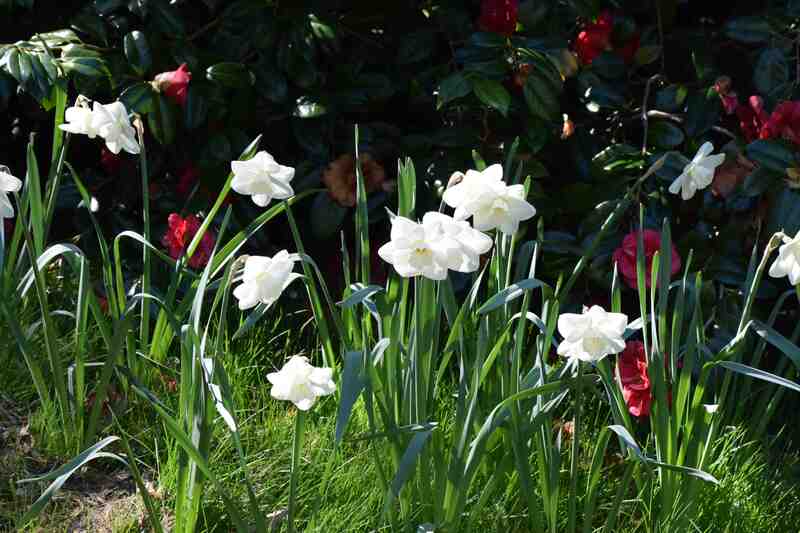 I also have another passion and that is white flowers…have planted loads of white daffs over the years in my tiny white garden… and because it is enclosed the perfume has been breathtaking this year…dry weather I think…and Stainless looks like a winner.